Introducing the TBS-1080 Chlorine Dioxide (CD) Gas Generation System, designed for the disinfection of BioSafety Cabinets (BSCs) in compliance with NSF/ANSI Standard 49 protocol (G.7.3.2.1 Method 1) for the fixed mass of chlorine dioxide gas. Maintaining a clean and safe BSC requires routine decontamination. To prevent pathogenic agents used within the BSC to be released and to potentially contaminate the environment or expose personnel performing a service, BSC decontamination is required prior to any access to any part of the cabinet that may be contaminated e.g. maintenance work, filter changes, decommissioning or performance testing and certification. 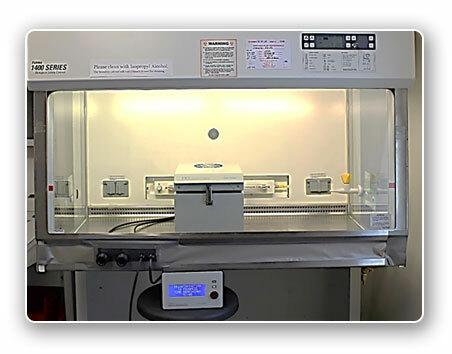 The NSF International (NSF/ANSI 49 Class II (laminar flow) BioSafety Cabinetry) provides guidance for three primary methods for decontaminating BSCs: formaldehyde gas, vapor phase hydrogen peroxide, and chlorine dioxide gas. NSF/ANSI Standard 49 protocol (G.7.3.2.1 Method 1), for the fixed mass of chlorine dioxide, has a minimum requirement of 0.13g/ft3 of chlorine dioxide gas. Uses patented technology that combines efficacy and affordability. Easily fits inside the BSC, eliminating the need for external hoses. Does not use or produce chlorine gas (Cl2). Easy-to-use instructions on the large display of the control panel show the progress of the decontamination. 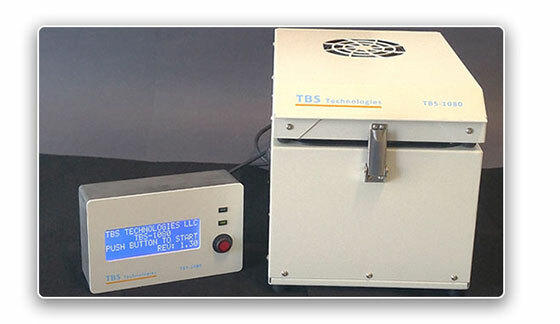 The TBS-1080 uses reagent solutions in prepackaged cartridges, the CD-Pak and the R-Pak, for the generation of CD gas and the neutralization of the CD gas reaction mixture. The CD-Pak cartridge contains a 25% solution of Sodium Chlorite and the R-Pak dual cartridge contains an activation solution as well as a quenching and neutralizing solution that provides for safe disposal after the disinfection procedure is completed. The CD-Pak-60 and R-Pak-60 are used for disinfecting BSCs up to 60 ft3 and the CD-Pak-90 and R-Pak-90 cartridges are used for BSCs up to 90 ft3. 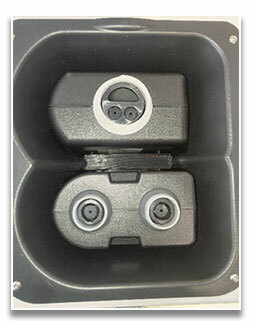 The TBS-1080 comes in a hard shell Pelican-style carrycase with the control panel and spaces for one set of cartridges. The TBS-1080 operates with 120 VAC converted to 12 VDC. The TBS-1080 is compact, measuring 10.1” x 10.3” x 14.3”, weighing 12.1 pounds. Green initiative: The TBS cartridges are returnable using a TBS provided shipping tote, and will be refilled with the chemical reagents by TBS. Always observe all safety precautions and procedures. Read and follow the Directions for Use.